Not to be confused with Propylene glycol, Diethylene glycol, or Glycol. Ethylene glycol (IUPAC name: ethane-1,2-diol) is an organic compound with the formula (CH2OH)2. It is mainly used for two purposes, as a raw material in the manufacture of polyester fibers and for antifreeze formulations. It is an odorless, colorless, sweet-tasting, viscous liquid. Ethylene glycol is toxic. Household pets are especially susceptible to ethylene glycol poisoning from vehicle antifreeze leaks. This reaction can be catalyzed by either acids or bases, or can occur at neutral pH under elevated temperatures. The highest yields of ethylene glycol occur at acidic or neutral pH with a large excess of water. Under these conditions, ethylene glycol yields of 90% can be achieved. The major byproducts are the oligomers diethylene glycol, triethylene glycol, and tetraethylene glycol. The separation of these oligomers and water is energy-intensive. About 6.7 million tonnes are produced annually. 2) to ethylene carbonate. This ring is then hydrolyzed with a base catalyst in a second step to produce mono-ethylene glycol in 98% selectivity. The carbon dioxide is released in this step again and can be fed back into the process circuit. The carbon dioxide comes in part from the ethylene oxide production, where a part of the ethylene is completely oxidized. Methanol is recycled. Therefore, only carbon monoxide, hydrogen, and oxygen are consumed. One plant with a production capacity of 200 000 tons ethylene glycol per year is in Inner Mongolia, a second plant in China with a capacity of 250 000 tons per year was scheduled for 2012 in the province of Henan. As of 2015, four plants in China with a capacity of 200 000 t/a each were operating with at least 17 more to follow. The caterpillar of the Greater wax moth, Galleria mellonella, has gut bacteria with the ability to degrade polyethylene (PE) into ethylene glycol. According to most sources, French chemist Charles-Adolphe Wurtz (1817–1884) first prepared ethylene glycol in 1856. He first treated "ethylene iodide" (C2H4I2) with silver acetate and then hydrolyzed the resultant "ethylene diacetate" with potassium hydroxide. Wurtz named his new compound "glycol" because it shared qualities with both ethyl alcohol (with one hydroxyl group) and glycerin (with three hydroxyl groups). In 1859, Wurtz prepared ethylene glycol via the hydration of ethylene oxide. There appears to have been no commercial manufacture or application of ethylene glycol prior to World War I, when it was synthesized from ethylene dichloride in Germany and used as a substitute for glycerol in the explosives industry. In the United States, semicommercial production of ethylene glycol via ethylene chlorohydrin started in 1917. The first large-scale commercial glycol plant was erected in 1925 at South Charleston, West Virginia, by Carbide and Carbon Chemicals Co. (now Union Carbide Corp.). By 1929, ethylene glycol was being used by almost all dynamite manufacturers. In 1937, Carbide started up the first plant based on Lefort's process for vapor-phase oxidation of ethylene to ethylene oxide. Carbide maintained a monopoly on the direct oxidation process until 1953, when the Scientific Design process was commercialized and offered for licenses. Ethylene glycol is primarily used in antifreeze formulations (50%) and as a raw material in the manufacture of polyesters such as polyethylene terephthalate (PET) (40%). The major use of ethylene glycol is as a medium for convective heat transfer in, for example, automobiles and liquid-cooled computers. Ethylene glycol is also commonly used in chilled-water air-conditioning systems that place either the chiller or air handlers outside, or systems that must cool below the freezing temperature of water. In geothermal heating/cooling systems, ethylene glycol is the fluid that transports heat through the use of a geothermal heat pump. The ethylene glycol either gains energy from the source (lake, ocean, water well) or dissipates heat to the sink, depending on whether the system is being used for heating or cooling. Pure ethylene glycol has a specific heat capacity about one half that of water. So, while providing freeze protection and an increased boiling point, ethylene glycol lowers the specific heat capacity of water mixtures relative to pure water. A 1:1 mix by mass has a specific heat capacity of about 3140 J/(kg·°C) (0.75 BTU/(lb·°F)), three quarters that of pure water, thus requiring increased flow rates in same system comparisons with water. The formation of large bubbles in cooling passages of internal combustion engines will seriously inhibit heat flow (flux) from that area, thus allowing nucleation (tiny bubbles) heat transfer to occur is not advisable. Large bubbles in cooling passages will be self-sustaining or grow larger, with virtually the complete loss of cooling in that spot. With pure MEG that hot spot has to get to 200 °C (392 °F). Cooling due to other effects such as air draft from fan etc. (not considered in pure nucleation analysis) will assist in preventing large-bubble formation. Pure ethylene glycol freezes at about −12 °C (10.4 °F) but, when mixed with water, the mixture freezes at a lower temperature. For example, a mixture of 60% ethylene glycol and 40% water freezes at −45 °C (−49 °F). Diethylene glycol behaves similarly. The freezing point depression of some mixtures can be explained as a colligative property of solutions but, in highly-concentrated mixtures such as the example, deviations from ideal solution behavior are expected due to the influence of intermolecular forces. Because of the depressed freezing temperatures, ethylene glycol is used as a de-icing fluid for windshields and aircraft, as an antifreeze in automobile engines, and as a component of vitrification (anticrystallization) mixtures for low-temperature preservation of biological tissues and organs. Mixture of ethylene glycol and water can also be chemically termed as glycol concentrate/compound/mixture/solution. The use of ethylene glycol not only depresses the freezing point of aqueous mixtures, but also elevates their boiling point. This results in the operating temperature range for heat-transfer fluids being broadened on both ends of the temperature scale. The increase in boiling temperature is due to pure ethylene glycol having a much higher boiling point and lower vapor pressure than pure water, as is typical with most binary mixtures of volatile liquids. In the plastic industry, ethylene glycol is an important precursor to polyester fibers and resins. Polyethylene terephthalate, used to make plastic bottles for soft drinks, is prepared from ethylene glycol. Ethylene glycol is one precursor to polyethyleneterephthalate, which is produced on the multimillion ton scale annually. Ethylene glycol is used in the natural gas industry to remove water vapor from natural gas before further processing, in much the same manner as triethylene glycol (TEG). Because of its high boiling point and affinity for water, ethylene glycol is a useful desiccant. Ethylene glycol is widely used to inhibit the formation of natural gas clathrates (hydrates) in long multiphase pipelines that convey natural gas from remote gas fields to a gas processing facility. Ethylene glycol can be recovered from the natural gas and reused as an inhibitor after purification treatment that removes water and inorganic salts. Natural gas is dehydrated by ethylene glycol. In this application, ethylene glycol flows down from the top of a tower and meets a rising mixture of water vapor and hydrocarbon gases. Dry gas exits from the top of the tower. The glycol and water are separated, and the glycol recycled. Instead of removing water, ethylene glycol can also be used to depress the temperature at which hydrates are formed. The purity of glycol used for hydrate suppression (monoethylene glycol) is typically around 80%, whereas the purity of glycol used for dehydration (triethylene glycol) is typically 95 to more than 99%. Moreover, the injection rate for hydrate suppression is much lower than the circulation rate in a glycol dehydration tower. 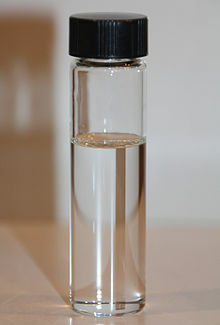 Minor uses of ethylene glycol include the manufacture of capacitors, as a chemical intermediate in the manufacture of 1,4-dioxane, as an additive to prevent corrosion in liquid cooling systems for personal computers, and inside the lens devices of cathode-ray tube type of rear projection televisions. Ethylene glycol is also used in the manufacture of some vaccines, but it is not itself present in these injections. It is used as a minor (1–2%) ingredient in shoe polish and also in some inks and dyes. Ethylene glycol has seen some use as a rot and fungal treatment for wood, both as a preventative and a treatment after the fact. It has been used in a few cases to treat partially rotted wooden objects to be displayed in museums. It is one of only a few treatments that are successful in dealing with rot in wooden boats, and is relatively cheap. Ethylene glycol may also be one of the minor ingredients in screen cleaning solutions, along with the main ingredient isopropyl alcohol. Ethylene glycol is commonly used as a preservative for biological specimens, especially in secondary schools during dissection as a safer alternative to formaldehyde. It is also used as part of the water-based hydraulic fluid used to control subsea oil and gas production equipment. Ethylene glycol is used as a protecting group in organic synthesis to protect carbonyl compounds such as ketones and aldehydes. Ethylene glycol is used as a protecting group for carbonyl groups in organic synthesis. Treating a ketone or aldehyde with ethylene glycol in the presence of an acid catalyst (e.g., p-toluenesulfonic acid; BF3·Et2O) gives the corresponding a 1,3-dioxolane, which is resistant to bases and other nucleophiles. The 1,3-dioxolane protecting group can thereafter be removed by further acid hydrolysis. In this example, isophorone was protected using ethylene glycol with p-toluenesulfonic acid in moderate yield. Water was removed by azeotropic distillation to shift the equilibrium to the right. Ethylene glycol is highly toxic, with an oral LDLo = 786 mg/kg for humans. The major danger is due to its sweet taste, which can attract children and animals. Upon ingestion, ethylene glycol is oxidized to glycolic acid, which is, in turn, oxidized to oxalic acid, which is toxic. It and its toxic byproducts first affect the central nervous system, then the heart, and finally the kidneys. Ingestion of sufficient amounts is fatal if untreated. Several deaths are recorded annually in the U.S. alone. Antifreeze products for automotive use containing propylene glycol in place of ethylene glycol are available. They are generally considered safer to use, as propylene glycol does not taste as good[note 1] and is converted in the body to lactic acid, a normal product of metabolism and exercise. Australia, the UK, and seventeen US states (as of 2012) require the addition of a bitter flavoring (denatonium benzoate) to antifreeze. In December 2012, US antifreeze manufacturers agreed voluntarily to add a bitter flavoring to all antifreeze that is sold in the consumer market of the US. Ethylene glycol is a high-production-volume chemical; it breaks down in air in about 10 days and in water or soil in a few weeks. It enters the environment through the dispersal of ethylene glycol-containing products, especially at airports, where it is used in deicing agents for runways and aeroplanes. While prolonged low doses of ethylene glycol show no toxicity, at near lethal doses (≥ 1000 mg/kg per day) ethylene glycol acts as a teratogen. "Based on a rather extensive database, it induces [skeletal variations and malformations] in rats and mice by all routes of exposure." This molecule has been observed in outer space. ^ Pure propylene glycol does not taste bitter, and pure propylene glycol is often used as a food additive, for instance in cake icing and shelf-stable whipped cream. Industrial-grade propylene glycol usually has a slightly bitter or acrid taste due to impurities. See the article on propylene glycol for more information. The relative sweetness of ethylene glycol and propylene glycol is discussed in the Merck Index, and neither compound is described as bitter. ^ a b c d e f NIOSH Pocket Guide to Chemical Hazards. "#0272". National Institute for Occupational Safety and Health (NIOSH). ^ Elert, Glenn. "Viscosity". The Physics Hypertextbook. Retrieved 2007-10-02. ^ Nexant/Chemsystems, "Coal to MEG, Changing the Rules of the Game" (PDF). Archived from the original on July 14, 2011. Retrieved 2016-08-08. CS1 maint: BOT: original-url status unknown (link) (PDF; 5,4 MB), 2011 Prospectus. ^ ‹See Tfd›983 EP 046 983, ‹See Tfd›S. Tahara et al., "Process for continuously preparing ethylene glycol", assigned to Ube Industries and H. T. Teunissen and C. J. Elsevier, Ruthenium catalyzed hydrogenation of dimethyl oxalate to ethylene glycol, J. Chem. Soc., Chem. Commun., 1997, 667–668), DOI:10.1039/A700862G. ^ S. Zhang et al., Highly-Dispersed Copper-Based Catalysts from Cu–Zn–Al Layered Double Hydroxide Precursor for Gas-Phase Hydrogenation of Dimethyl Oxalate to Ethylene Glycol, Catalysis Letters, Sept. 2012, 142 (9), 1121–1127, DOI:10.1007/s10562-012-0871-8. ^ Gräbner, Martin (2014-11-24). Industrial Coal Gasification Technologies Covering Baseline and High-Ash Coal. ISBN 9783527336906. ^ Yang, Jun; Yang, Yu; Wu, Wei-Min; Zhao, Jiao; Jiang, Lei (2014-12-02). "Evidence of polyethylene biodegradation by bacterial strains from the guts of plastic-eating waxworms". Environmental Science & Technology. 48 (23): 13776–13784. Bibcode:2014EnST...4813776Y. doi:10.1021/es504038a. ISSN 1520-5851. PMID 25384056. ^ Bombelli, Paolo; Howe, Christopher J.; Bertocchini, Federica (2017-04-24). "Polyethylene bio-degradation by caterpillars of the wax moth Galleria mellonella". Current Biology. 27 (8): R292–R293. Bibcode:1996CBio....6.1213A. doi:10.1016/j.cub.2017.02.060. hdl:10261/164618. ISSN 0960-9822. PMID 28441558. ^ Khan, Amina (April 24, 2017). "Stubborn plastic may have finally met its match: the hungry wax worm". Los Angeles Times. Retrieved April 25, 2017. ^ Adolphe Wurtz (1856). "Sur le glycol ou alcool diatomique" [On glycol or dibasic alcohol]. Comptes Rendus. 43: 199–204. ^ Ad. Wurtz (1859) "Synthèse du glycol avec l'oxyde d'éthylène et l'eau" (Synthesis of glycol from ethylene oxide and water), Comptes rendus, 49 : 813–815. ^ "Ethylene glycol acetal". The Organic Synthesis Archive. synarchive.com. ^ Laine, Richard M.; Blohowiak, Kay Youngdahl; Robinson, Timothy R.; Hoppe, Martin L.; Nardi, Paola; Kampf, Jeffrey; Uhm, Jackie (17 October 1991). "Synthesis of pentacoordinate silicon complexes from SiO2" (PDF). Nature. 353 (353): 642–644. Bibcode:1991Natur.353..642L. doi:10.1038/353642a0. ^ Theodora W. Greene; Peter G. M. Wuts (1999). Protective Groups in Organic Synthesis (Third ed.). John Wiley & Sons. pp. 312–322. ISBN 978-0-471-16019-9. ^ J. H. Babler; N. C. Malek; M. J. Coghlan (1978). "Selective hydrolysis of α,β- and β,γ-unsaturated ketals: method for deconjugation of β,β-disubstituted α,β-unsaturated ketones". J. Org. Chem. 43 (9): 1821–1823. doi:10.1021/jo00403a047. ^ Safety Officer in Physical Chemistry (November 23, 2009). "Safety (MSDS) data for ethylene glycol". Oxford University. Retrieved December 30, 2009. ^ Ethylene glycol. National Institute for Occupational Safety and Health. Emergency Response Database. August 22, 2008. Retrieved December 31, 2008. ^ The Merck Index (15th ed.). Royal Society of Chemistry. 2013. pp. M5122. ^ The Merck Index (15th ed.). Royal Society of Chemistry. 2013. pp. M9238. ^ Pieter Klapwijk (January 27, 2010). "Ethylene Glycol Poisoning". The Rested Dog Inn. Retrieved October 11, 2012. ^ "Antifreeze and Engine Coolant Being Bittered Nationwide". Consumer Specialty Products Association. 13 December 2012. Archived from the original on 28 December 2012. Retrieved 30 June 2016. ^ "Statement of the Science Report for Ethylene Glycol". 3.3.2.2 Non-neoplastic effects. Health Canada www.hc-sc.gc.ca. June 24, 2013. Retrieved 27 August 2014. ^ J. M. Hollis; F. J. Lovas; P. R. Jewell; L. H. Coudert (2002-05-20). "Interstellar Antifreeze: Ethylene Glycol". The Astrophysical Journal. 571 (1): L59–L62. Bibcode:2002ApJ...571L..59H. doi:10.1086/341148. Hairong Yue; Yujun Zhao; Xinbin Ma; Jinlong Gong (2012). "Ethylene glycol: properties, synthesis, and applications". Chemical Society Reviews. 41 (11): 4218–4244. Bibcode:2012ChSRv..41.6507P. doi:10.1039/C2CS15359A. PMID 22488259.